Nakiri Alice is a highly skilled chef that is currently attending Tootsuki Culinary Academy as a member of the Nakiri family. Ever since her cousin Erina told Alice her cooking was terrible when they were children, Alice's goal has been to become a top class chef and surpass Erina and her God Tongue. Before moving back to Japan to attend Tootsuki, she lived in Denmark with her family and began her focus on molecular gastronomy. As a result, her cooking is based on combining modern tools with the most advanced theories in order to deliver the best dishes she possibly can. Alice has short silver hair with a left bang that is longer than the rest of her hair. She has fair skin and red eyes and tends to wear the beige Tootsuki vest uniform instead of the standard school uniform, and her cooking uniform is a short-sleeved chef's uniform with red accents on her cuffs and collar. 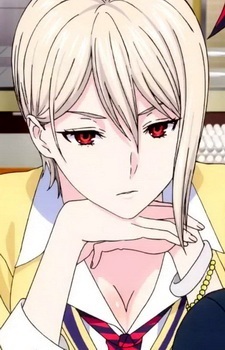 Alice has a very demanding personality that seems to emphasize her Nakiri upbringing. She's bossy and pushy, and will do what it takes to get her way, utilizing not only her personality but also her incredibly advanced cunning and wit. As a result, she absolutely hates to lose; an example here is the fact that—not wanting to be outdone by Erina— once she saw that Erina had an aid called Hisako Arato, she in turn forcefully made Kurokiba Ryo join her as an aid. When not competing, though, Alice is extremely friendly and talkative. She loves to prod and make fun of people during conversations, but will pout to no end when she wants or needs something or thinks something has happened to make her look worse.